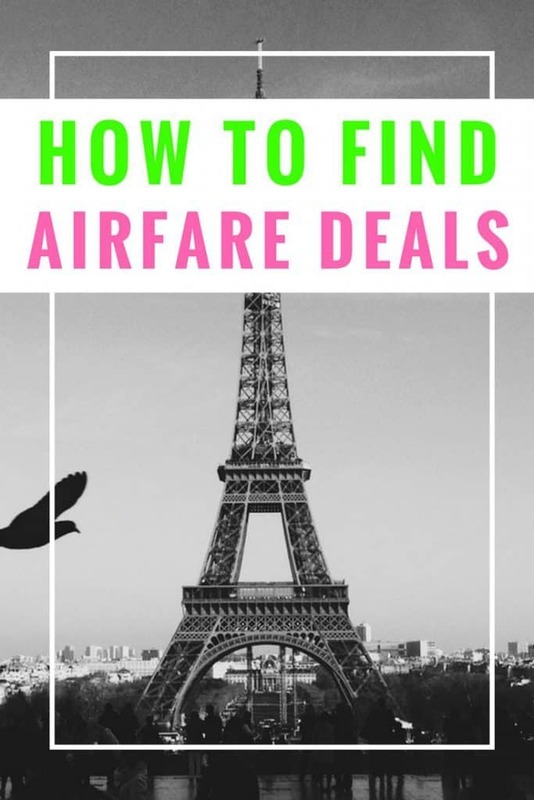 Do you have that one annoying friend who always gets amazing flight deals? Did you imagine them slaving over their computer late at night, every night, obsessively checking and re-checking airline deals? Well, I used to be that person. Most days, I had Google Flights open in one tab, a Twitter feed for the best deals open in another, and half a dozen airline websites in the rest. Even with all that work, I’d still miss a deal or two. Eventually, I figured out a better way: Let someone else do all that work! Even better, let a real, tried and true, cheap flights obsessed someone else do it. These days, I live my life away from my computer (gasp! ), check my email a few times a day, and let the cheap flight deals come to me instead. What’s the secret? 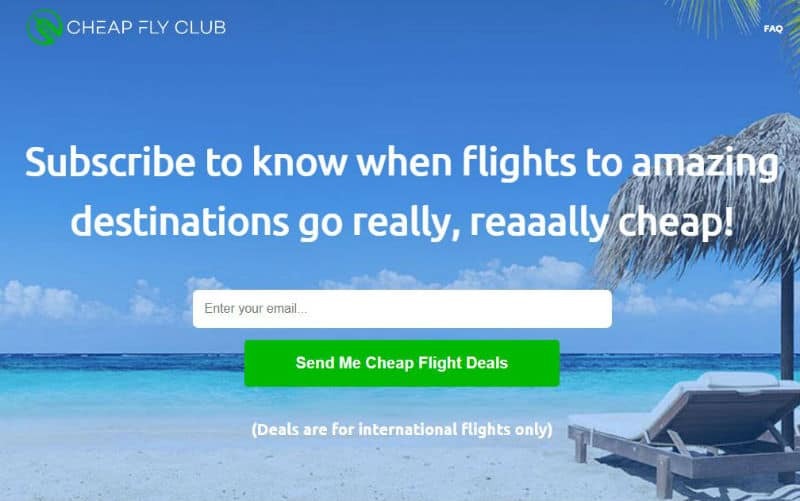 I signed up for Cheap Fly Club, run by a super nice fellow named Josh, who’s a flight finding travel expert. I imagine him and his team hunched over their computers 24 hours a day, finding me the best deals. 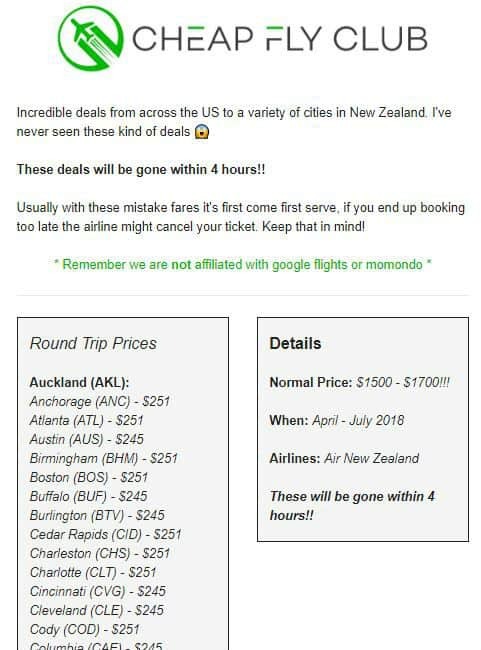 New York to Christchurch, New Zealand for $245? Fort Lauderdale to San Jose, Costa Rica from $199? Chicago to Paris for $392? Any of these deals sound good? They’re just a few of the prices I’ve seen in my inbox since I joined the completely free Cheap Fly Club last month. I’ve even clicked on dozens of deals in numerous emails I’ve received and have verified for myself that they’re legit and real. Getting flight deals by email is a great time saver. Subscription services watch for sales, prices errors and fare drops to destinations all over the world. It’s so easy! When they find a great deal, they send you an email. That’s it. Even better, it’s completely free to sign up for emails from Josh and the team at Cheap Fly Club. If you want to get even more deals, there’s also a paid Premium membership that starts at $3 a month however I’ll talk about that more, later in this post. All of the deals Cheap Fly Club sends are for flights that are at least 50% off, but often they’re an even bigger discount. That means you won’t be swamped with emails with small dips in the prices. Everything they send means you’re paying half or less! FYI: All the deals that they send are for international flights only, and they’re primarily for USA residents, though you’ll see deals from Canada’s largest cities as well. Now don’t despair if you’re from outside North America since there’s a good chance you can go the other way for a similar price as well! Curious to know what the emails from Cheap Fly Club look like? Here’s one of those mistake airfare deals that landed in my inbox earlier this week. What’s up with the premium membership? The paid Premium Membership at Cheap Fly Club gives access to all the deals, which occur about four times more than the free subscription. It starts at $3 a month. The biggest bonus is you can also choose your departure airport with a premium membership. Will I get spammed with email? No, since on the free plan, I’ve been getting about seven emails a week, or one a day. They were all great deals, so I was glad to see them in my inbox! Do I need to fly last minute? No, most of the Cheap Fly Club deals are between 3 to 10 months away. There are some last minute deals, but I’ve found that the best deals tend to be for a few months out. There really isn’t one. The basic subscription is free. Try it, and if you don’t like it, all you have to do is hit unsubscribe. Worst case, they provide you with a bit of wanderlust. Best case, a very cheap flight. Hankering for some more sweet tips on how to find cheap airline tickets? 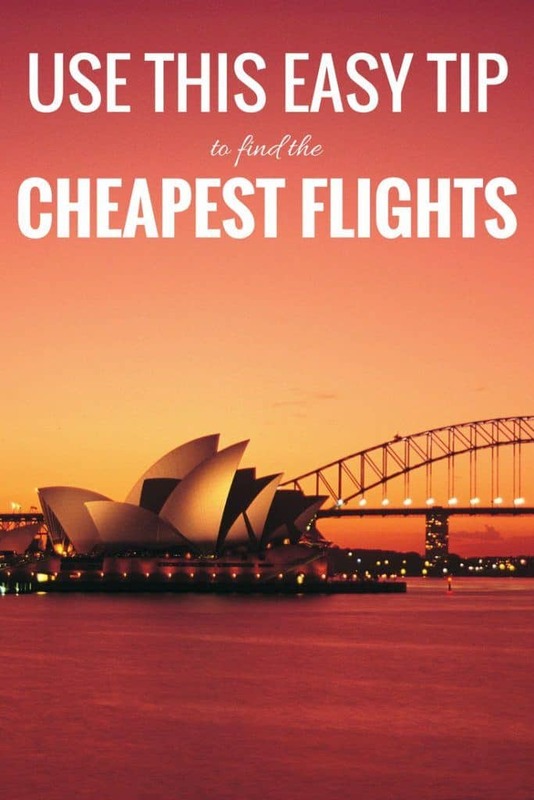 Check out our articles on how to find the cheapest flight to anywhere and our six quick steps to nailing the cheapest flight.